I do feel a little uncomfortable using the term 'post-Paulian', and not just because it's rather pretentious. For one, it makes the very much living Greg Paul sound as if he's kicked the bucket, which he assuredly hasn't; it also sounds a little derogatory towards his work. However, that's not the idea at all. 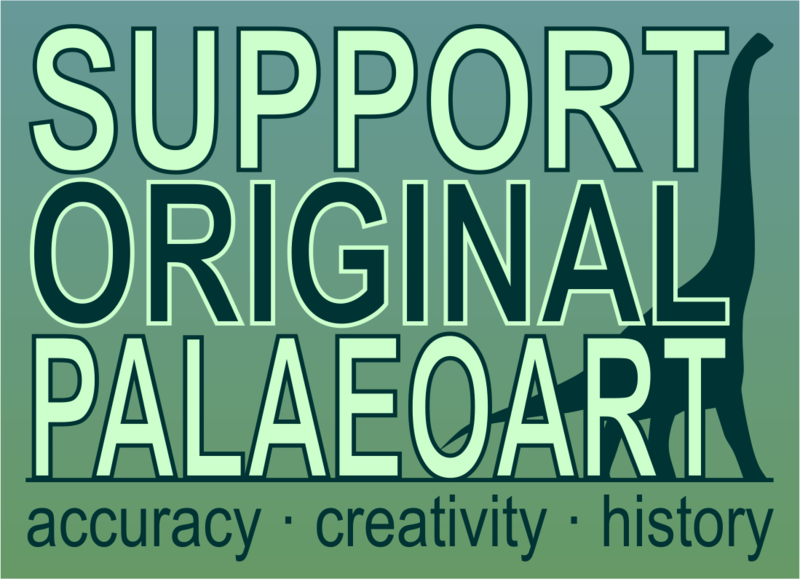 Paul is one of the all-time titans of palaeoart, and with good reason. His trademark style rubbed off on seemingly everyone in the '80s, '90s and into the 2000s, so that his way of reconstructing dinosaurs became the definitive, ultimate way. A great volume of the work reproduced in the original Dinosaur Art featured reassuringly Paulian dinosaurs (not least because Paul himself was in there!). However, five years and one All Yesterdays later, and much of the work in DA2 has taken on a different character. Granted, there are still a great many 'photo-realistic' Paulian reconstructions in this book (including Sergey Krasovskiy's fabulous Torvosaurus on the cover), but they don't dominate as they did in DA1. Got mine signed! Clockwise R-L: Mark Witton, Bob Nicholls, Steve White. In fact, DA2 is perhaps the most perfect example of the onward March of the Floof in dinosaur art. Reconstructions of birdlike theropods by the likes of Emily Willoughby, Jason Brougham and Tom Björklund feel worlds apart from the ultra-sleek, Paulian reconstructions that predominated in DA1. But there's more to it than that. Artists like Krasovskiy and Andrey Atuchin do a magnificent job of holding up the photo-realism end, and their work does tend to feel much more cohesive than many of the photo-manips that appeared in DA1. However, others - and especially Mark Witton, gawd bless 'im - take a more stylised approach and introduce a tonal variety that many argued was missing in DA1. I'm also very fond of Björklund's work, with its gorgeous brown-grey melancholy, inspired by the colour palette of his native Finland in winter (or possibly the original Quake). His take on Tyrannosaurus is quite something to behold. Then there's the matter of Vitali Klatt's chapter, entirely dedicated to his model making work, a first for DA. It's wonderful to see the same sculpts at varying stages of completion, with different paint jobs and buildups. No, these photos of the book aren't very good. That's partly on purpose. The print quality is actually excellent, promise. The format remains much the same, featuring interviews with each artist alongside spectacular reproductions of key artworks. The print quality here is just as gorgeous as in the original, and worthy of a much more expensive book. The interviews themselves do vary in quality, although this seems to be as much down to how much the artist was willing or wanted to say as anything. It's also hard to appeal to everyone; I'm more interested in why artists made certain choices in their reconstructions from a scientific standpoint, whereas others will be more interested in aesthetics and technique. Both are covered to an extent, although again there is generally more of a focus on the latter. I think Mark's interview is one of the best, and not just because I've met Mark a few times (honest); it's probably because he's a scientist first, and an artist second. Just a little taster of Vitali Klatt's models. To conclude: if you enjoyed the first one, buy the sequel, because it's very pretty, stuffed with great work, is excellent value for money, and features a whole chapter on Bob Nicholls' insanely meticulous reconstruction of Psittacosaurus as a life sized model (got to love the Bob). It's also a lovely record of a new generation of artists. As always, there'll be plenty of artists who deserve to feature and can't for various reasons, but of those that made the cut, all are more than worthy. I'm sure it'd make a great Christmas present, too. Order it from your local tax-paying bookshop today! Tom Björklund's T. rex, with camera flash. Wow, this T. rex is crazy. Grrrr, I need this yesterday! I would dispute the charicterization of Witton as "scientist first, artist second". I think it's impossible to separate the artist and the scientist in the man. I've felt for some time that he is probably the most well-rounded artist in terms of both technical and artistic proficiency of all time. Greg Paul is the only other artist I can think of who comes anywhere close to a similar "scientist artist" persona, and even he I would argue still falls more on the artist side. Here's hoping Hallet and Gurche make it into Dinosaur Art 3! If you could somehow combine Greg Paul (artist first, scientist second) and Bob Bakker (scientist first, artist second) into one person, then I think you'd get the same "equal parts scientist and artist" sort of person as Witton. It's more or less how he describes himself in the book.